Operating flatbed equipment poses risks to the drivers who have the tough, day-in, day-out job of hauling these loads. It’s an accepted fact in the profession that driving an old-school flatbed poses some of the most frequent and potentially dangerous hazards in the industry. 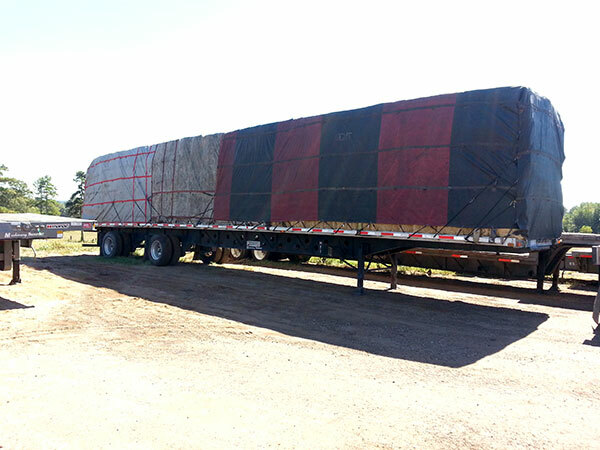 Tarping is required in about 60% of flatbed loads. It’s a significantly hazardous task, often performed multiple times each day by a driver, increasing the odds that something bad will happen eventually. As canvas tarps can weigh as much as 200 pounds, throwing and tugging them into place is a perfect storm scenario for strains, muscle tears and back injuries. Tarping also frequently requires the driver to climb on top of the load, as high as 13 feet off the hard pavement below—no safety handholds and no net. While the unloaded flatbed deck itself is typically five feet off the ground (a fall from four feet is considered sufficient to cause brain injuries in severe cases) the higher fall from atop the load could be catastrophic. Where freight facilities lack dedicated tarping areas, drivers also resort to impromptu roadside areas with little clearance from speeding traffic. Another area posing dangers primarily specific to flatbeds. Forklift trucks on an open flatbed can accidentally drive off the edge of the deck, posing the danger of fatal injury to anyone nearby. Because of the characteristics of flatbed freight, certain loads must be loaded or unloaded by cranes or other equipment remotely-operated from some distance away. This separation increases hazards on and around the trailer while the process is underway. Also, odd-shaped or large flatbed freight may be unstable until fully strapped down. Heavy freight may unexpectedly roll or topple and could cause traumatic injury to anyone working on or next to the trailer. The expertise of shippers loading freight can also pose an issue if the shippers aren’t specifically skilled in flatbed loading. Drivers may feel reluctant to intervene and correct customers loading the trailer in a manner that might be unsafe on the road or during unloading at the destination. By its oversized, odd-shaped nature, flatbed freight may place a driver at greater hazard from load shifting in transit than freight enclosed in a typical van trailer. Because many flatbeds don’t incorporate protective front bulkheads, drivers are at severe risk if heavy freight suddenly slides forward and impacts the cab during a scenario such as a sudden stop or a collision. Also, specific dangers accompany situations where very tall loads contact overhead obstacles. Flatbeds frequently deliver loads to construction zones or other makeshift loading/unloading areas that provide few of the safety protections drivers of conventional trailers benefit from in formal freight facilities. Flatbed drivers report a higher incidence of injuries more normally associated with construction work than freight hauling, such as puncture wounds from sharp objects, exposure to toxic substances, electrical hazards, etc. Curtain side trailers can eliminate or significantly reduce some risks associated with flatbed equipment while still accommodating many loads that previously required a flatbed. Making the hazardous chore of tarping a thing of the past alone removes a major source of potential injuries—not to mention improving the odds of recruiting and retaining professional drivers.